Movement for a Democratic Society is a multi-issue activist organization affiliated with the newly revived Students for a Democratic Society (SDS). Many of its members are veterans of the New Left in the 60's and 70's. The goal of MDS is the creation of a more egalitarian society in both the political and economic spheres. 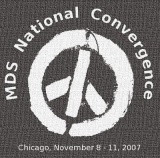 MDS believes in participatory democracy, the expansion of human rights, universal healthcare, the rejection of discrimination based on race, gender or sexual preference, the preservation of the earth's environment, the expansion of workers' rights, a more equitable distribution of wealth, and the rejection of militarism and war as a way of resolving differences among peoples and nations. Movement for a Democratic Society is a global association of people on the left. It seeks to create a sustained community of educational and political concern and actions: one bringing together liberals and radicals, activists and scholars, students, faculty and workers in all trades. It maintains a vision of a democratic society, where at all levels the people have control of the decisions which affect them and the resources on which they are dependent. It seeks a relevance through the continual focus on realities and on the programs necessary to effect change at the most basic levels of economic, political, and social organization. It feels the urgency to put forth a radical, democratic program counter-posed to authoritarian movements. In early 2006, a group of former Students for a Democratic Society members and sympathisers, led by Democratic Socialists of America activist Paul Buhle joined with some a new generation of college students to re-found Students for a Democratic Society. The movement now has over 130 chapters across the USA. Also Buhle and others founded an SDS support group for older activists-Movement for a Democratic Society . 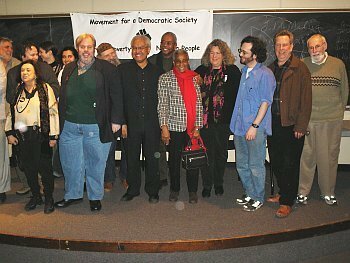 Paul Buhle, Thomas Good and Bruce Rubenstein played key roles in founding the Movement for a Democratic Society in 2006. Power has resided largely with three figures: historian Paul Buhle, once editor of the original SDS journal Radical America; Thomas Good, a 48-year-old Communist-turned-anarchist who created the new SDS website and Bruce Rubenstein, a Connecticut personal-injury attorney. The Weather controversy blew up when former Weather Underground leader Bernardine Dohrn, was invited to speak at the first new SDS conference, held in Providence, Rhode Island, in April 2006. Dohrn received a rousing welcome, but when Bob Ross, an early SDS leader, used his talk to lament that "the largest legal and unarmed movement in the history of the West" turned "ineffectually violent and useless," he was received coolly. At the first new SDS national convention in Chicago, in August, Good opened the proceedings by reading greetings from Dohrn. Moreover, Bruce Rubenstein, MDS's treasurer, was unapologetic about his Weather history and says that if it were 1969 he would "do it all over again..."
Known MDSers members include Paul Krehbiel, Tom Good, Jay Jurie, Paul Buhle and Jim Zarichny. The event was held in the Graduate Center, 65 Fifth Avenue, and about 100 participants were in attendance. The meeting featured several speakers who are well known figures on the U.S. Left and an agenda that centered around electing a board of directors for MDS, Incorporated – the non-profit arm of MDS that was founded last August in Chicago, at the national SDS convention. Its purpose is to provide SDS’ student activists with a legal defense fund, monies for the Radical Education Project and a general fund for meetings, conventions and other SDS functions. Manning Marable was elected as Chair of the new Board. The new board, elected by acclamation, included: Mark Rudd, David Graeber, Judith Malina, Jesse Zearle, Kate Khatib, Roderick Long, Al Haber, Manning Marable, Muhammed Ahmad, Charlene Mitchell, Starhawk, John O’Brien, Barbara Ehrenreich, Gideon Oliver, Jeff Jones and Bert Garskof. Elected as officers, in addition to Marable as Chair, were three Vice Chairs: Paul Buhle, Judith Malina and Jesse Zearle. Board nominees where were not able to attend the conference were included in the appointment by acclamation. The list included Elliott Adams, Panama Vicente Alba, Tariq Ali, Stanley Aronowitz, David Barsamian, Rosalyn Baxandall, John Bracey, Jr., John Brittain, Robb Burlage, Noam Chomsky, Jayne Cortez, Carl Davidson, Angela Davis, Bernardine Dohrn, Barbara Epstein, Gustavo Esteva, Lawrence Ferlinghetti, Stephen Fleischman, Bill Fletcher Jr, Tom Hayden, Gerald Horne, Florence Howe, Mike James, Robin D G Kelley, Alice Kessler Harris, Rashid Khalidi, Mike Klonsky, Betita Martinez, Ethelbert Miller, Roxanne Dunbar-Ortiz, Barbara Ransby, Patricia Rose, Michael Rossman, Studs Terkel, Charlene Teters, Jerry Tucker, Immanuel Wallerstein, Cornel West, Leonard Weinglass and Howard Zinn. 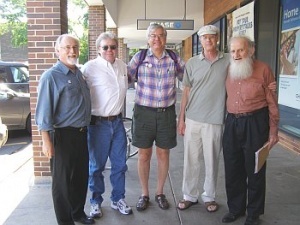 Carl Davidson, Mike Klonsky and Bill Ayers were also present. "The derision and disrespect for criticisms (going back to Banning Brigade disregard of democratic decisions made for the 2006 SDS Convention and the controversy which arose following the 2006 convention's decision to approve the formation of MDS, Inc.) which the Banning Brigade has dished out, and the crude insults they introduced into our sds/mds conversation have predictably resulted in more of the same, escalation of anger and frustration." "The newly elected board of MDS, Inc., is broadly representative of the whole left, but its biggest names–Tom Hayden, Barbara Ehrenreich, Cornel West, Angela Davis and Noam Chomsky–are symbolic luminaries, not actively involved. Much hinges on whether the new chairman, Manning Marable, a distinguished African-American historian at Columbia University, can guide MDS, Inc., beyond its present contretemps to “assist and promote the development of activism among young people,” as he envisions." This page was last modified on 27 April 2011, at 08:26.